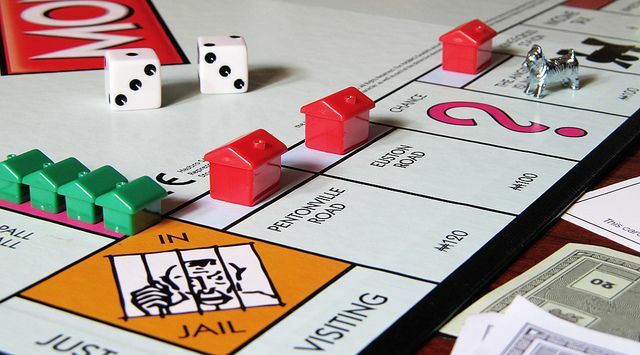 The popular board game Monopoly comes with a limited supply of 32 houses and 12 hotels that players can purchase to enhance their properties and increase the rent they charge other players. When the buildings have been purchased and are in use in the game, no more houses and hotels can be bought. When houses or hotels are returned to the bank, they are available for purchase by any player at their original price. If more than one player wants to purchase the same buildings, bidding commences and the buildings go to the highest bidder. If a player wants to build a house on a property and no houses are available, he can't build. The same is true if a player wants to build a hotel and no hotels are available. Allowing the purchase of unlimited houses and hotels and using a replacement token (such as a coin) to represent the purchase after all the buildings have been purchased from the bank.